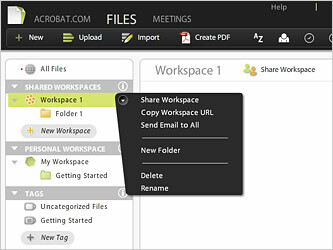 For the past two years, Adobe has been evolving a suite of online collaboration tools at its Acrobat.com website (the first services came online in June 2008). The latest iteration launches today with the release of Acrobat.com Workspaces. This new service lets users create virtual workspaces where they can share files and folders with others both within and outside their organization. It’s the vital collaboration piece that adds a workgroup dimension to all the existing tools: document sharing, PDF creator, web conferencing, Buzzword word processing, presentations and the spreadsheet-like Tables for sharing data. At last, the suite is complete and ready for use in a business collaboration setting. But it’s far from fully baked yet — the list of capabilities and features yet to be added remains far longer than those already available. Most users of the service won’t be concerned at the lack of more sophisticated options because Adobe is targeting people who are currently using emails and USB sticks to share information. “We are competing against email,” director of product management Rick Treitman told me in a briefing last week. Or, he went on, citing a phrase coined by Clayton Christensen, author of The Innovator’s Dilemma, the classic business book about disruptive innovations, “We’re competing against non-consumption.” In other words, Workspaces is designed to appeal to people who are just getting by with workarounds at the moment and who will only start using an online collaboration tool if it’s easy, convenient and cheap enough. So Workspaces is free if you only want to set up a single virtual workspace, and $15 per month for up to 20, or $39 per month for an unlimited number. There’s no limit on the number of collaborators you invite to participate in any workspace. Adobe expects the service will mostly be used when an individual or team within an organization want to share files with sub-contractors and suppliers and/or with customers and sales partners. In today’s highly distributed world, of course (in part due to the Web making long-distance communications easier and cheaper), such collaborations are becoming more and more commonplace. There are already dozens of similar services of varying functionality and scope already in the market, and several of them have been covered on this blog — notable examples include Central Desktop, Box.net and Google Apps. Adobe may be a latecomer, but it has reach, which is a vital success ingredient in this type of application. The brand is well known and trusted, and there are already more ten million people signed up to the Acrobat.com website, with around 100,000 more joining every week. So there’s no shortage of people to whom Adobe can market the new Workspaces service. Making it free for collaborators adds an extra slug of virality, because as each new workspace is created, so a new set of collaborators gets introduced to the service. There will come a time when the market starts to standardize and it will become harder to persuade collaborators to join a service that’s not one of the established platforms. We’re not there yet but Adobe’s user base gives it a strong advantage in contention — provided, that is, it can preserve the ubiquity of Flash technology, on which the suite of tools are built.